Landour continues to be one of my favourite getaway destinations from Delhi. Nestled far away from Mussorie it enjoys the advantage of the greatest views, pines dotting the walkways, pleasant landscapes and some unforgettable trails if you like to explore hill station on foot. 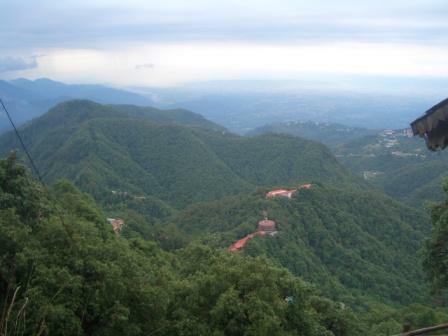 Landour takes its name from Llanddowror, a village in Carmarthenshire in Southwest Wales. It was built in 1825 as a sanatorium for the British Army Officers and presently this quaint hill station is house to Ruskin Bond, Tom Alter, Victor Banerjee and many others. 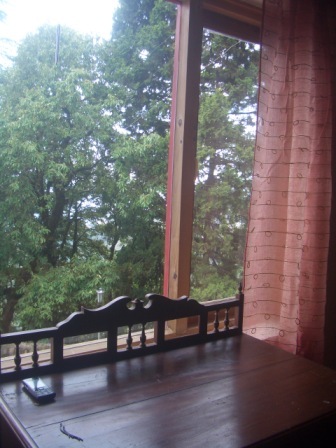 This hill station till a few years back boasted of few guest houses, and home stays. Our favourite hault was Devdarwoods located at an uphill near Sister’s Bazaar (interestingly the name owes to the nurses who stayed here during colonial times) where P and I stayed for a rent of Rs 600 inclusive of a complimentary breakfast spread which included toasts with an amazing range of preserves (apricot, plum, gooseberry), and peanut butter. Cut to 2013. K and I settled to stay at a beautiful homestay of Bhatty’s which is a good fifteen to twenty-minute hike from the Main gate of Woodstock School or from Sister’s Bazaar. We were welcomed over a breakfast of crisp toasts and preserves from Prakash. Prakash’s store @ Sister’s Bazaar sells a variety of preserves, chutney, jelly, peanut butter and I strongly recommend Apricot, Plum and Gooseberry preserve. The store also boasts of baking fresh breads and banana walnut cake. We had a list of places to try out. Mrs Bhatty recommended us to try out Chhaya Cafe and DP has been insisting to try out their Chicken Pot Pie ever since her trip to Landour. K and I walked down to Landour Bazaar to place order for a pair of hand crafted leather shoes. Instead we placed orders for a range of colourful shoes. While K bagged two pairs of yellow and red shoes in her kitty, I settled for beige, and blue coloured shoes. The shoes are priced between Rs 350-700. If you are staying in Landour for two to three days please order yourself a pair of these hand crafted leather shoes and sandals available in a variety of colours. After that we settled for a lunch at Chhaya Cafe. 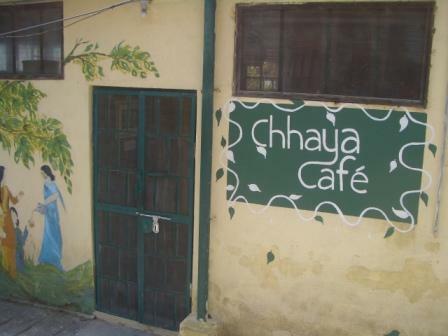 Chhaya Cafe is located at Malanghar Hill. You can enjoy a sunny afternoon lunch of Chicken Pot Pie, some Fresh Lime Water and a good array of freshly bakes in this small cafe managed by women. 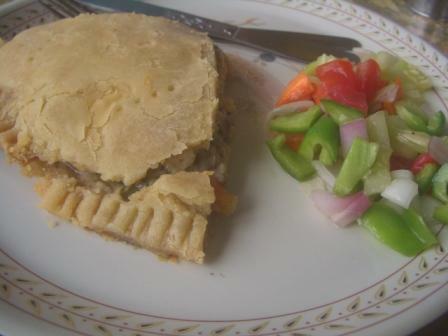 Chicken Pot Pie is a Chhaya Speciality and is served with a fresh salad. Other options include Mediterranean Platter, and Sandwiches. The Cafe is wi-fi enabled; to avert free wi-fi users, there is a request to order dishes within every one hour use of wi-fi facilities. Interesting indeed! We enjoyed the decor of Chhaya Cafe. 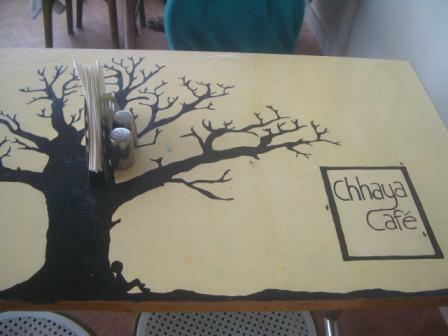 True to its name which means shelter, the cafe has a huge tree painted in the ceiling and tree motifs adorn some of the tables. A box of chalks are kept in some tables for enthusiastic artists. A meal for two would be a little over 500 INR. After wrapping our lunch here, we walked up to St. Paul’s Church and settled for a coffee break at Emily’s- the restaurant of newly restored Rokeby Manor. 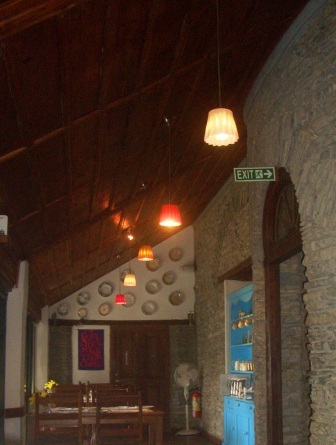 Emily’s is a new addition in Landour’s landscape with Rokeby Manor being transformed into a pretty place. Such “pretty” transformations in quiet hill stations like Landour have invited quite a few intruders in terms of increase in traffic in the road leading to Sister’s Bazaar from Landour Bazaar. While I secretly wanted the calm and peace one enjoyed the steep walk from Landour Bazaar to St. Paul’s Church I cherished the welcome change that Emily’s have brought in Landour. Emily’s is a must visit. The smell of freshly prepared bread welcomed us as we entered Emily’s. 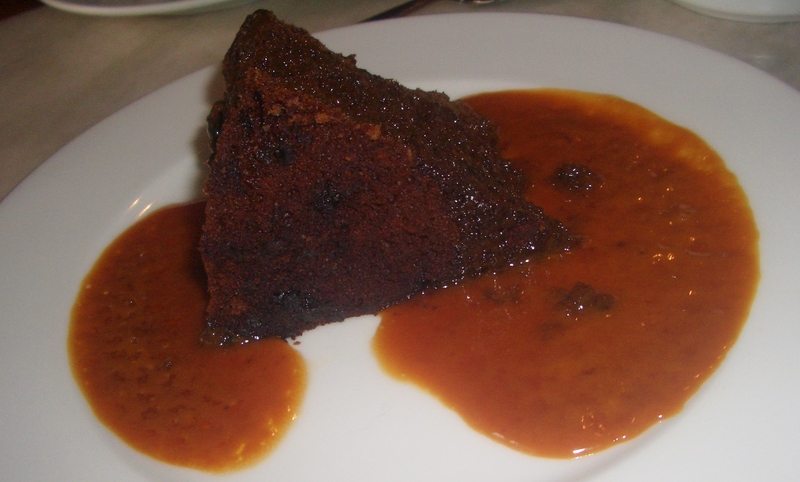 To begin with we ordered a Sticky Toffee Pudding and Coffee. Next day we settled for Shepherd’s Pie, Penne in Pesto Basil Sauce and Cappuccino. While we have no complaints about the food, interesting bit was a charity amount of Rs 5 that we were charged in the bill. Interesting Initiative! A Friend suggested that we should have tried their Indian menu as well and if we had our way we might even settle for their Dinner. Compared to other eating out options, prices are a little steep. The main courses are from Rs 350 onwards. So a meal for two with coffee, and taxes will cost Rs 1000+ for two people. A trip to Landour is incomplete without a tea/ coffee break at Char Dukan adjacent to St. Paul’s Church. Literally four cafes offer a variety of options from pancakes to waffles to piping hot Maggie. The icing of the trip was some beautiful kebabs ( shammi, sheekh ) we had at dinners at Bhatty’s. The best surprise was potato shammi kebab with freshly made mint dip and some lovely spinach dal. While I will try out my version of spinach dal this weekend, to reminiscence about the good times in Landour last weekend, if you are planning to take a weekend break with some great food you have to explore Landour. By Train : It is an overnight journey from Delhi/ New Delhi to Dehradun. Either board The Mussorie Express from Old Delhi or settle for The New Delhi- Dehradun Express which leaves New Delhi Railway Station at 11.55pm. By Bus: Volvo Buses to Mussorie can be booked from ISBT Delhi. Taxis are available from Mussorie to Sister’s Bazaar. Book yourself a taxi from the prepaid taxi booth near Dehradun Station. It costs us Rs 1010.